It’s firefly season around here. Bebe and I are enchanted by their glimmers as we walk in the early evening woods. Given the option, he’d have us stay in one spot for an hour watching lights blink on through the trees and occasionally bumble into us, with the sound of birds rustling themselves into shelter for the night. However the rising tides of mosquitoes always drive us on and homeward. Although much of our life is all upheaval these days, we are loving these simple summer moments: walking and hiking, sharing meals with friends, browsing through farm stands and farmers’ markets, swimming whenever possible, running through the rain, and – always – dancing. getting my rock on lately with songs like this one by Ainu-Japanese artist Kamiki Aya (“Revolver”). a little punk and a lot of pink, this song by Les Plastiscines sounds perfect for cool spring day dancing around in skirts and leggings AND for summer days heading to the beach (“Barcelona”). 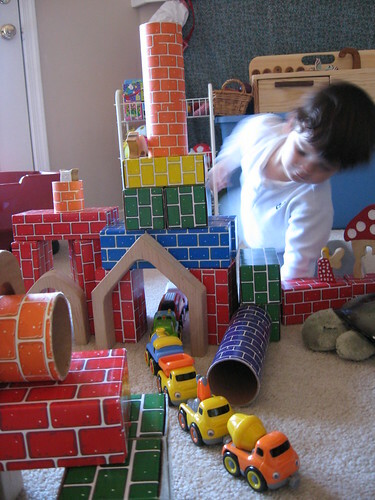 really enjoying this live version of “My Boy Builds Coffins” by Florence & The Machine. Dana of MADE is generously sharing a free & straight-forward tutorial on children’s striped summer shorts that I am eager to try for Bebe. Also found a fun little tie-dye project for putting quick fireworks into a child’s plain t-shirt. Sweet! This free tutorial shared by Chrysalis of the Butterfly Jungle blog. Thanks 🙂 there will definitely be some impromptu t-shirt embellishment at our house this weekend. a mini rainbow quilt pattern: what a sweet and simple idea! this would be a lovely project enlarged to a child’s bed or a picnic blanket, ne? and speaking of embroidery, bird artist Geninne Zlatkis has been creating some delicate embroidery and beaded embellishments of her bird watercolors that have been printed onto fabric. So beautiful! if you find it helpful to have some craft structure/community, Christine has just launched her 2nd annual 52 crafts in 52 weeks, starting with different kinds of printing projects in July. Potato prints, here we come! in a general summery theme, I wantwantreallywant a roll of these adorable gingham picnic linens from Neiman Marcus – blue gingham, please – they come in tearaway rolls like papertowels yet are actually cotton fabric and washable/reusable. 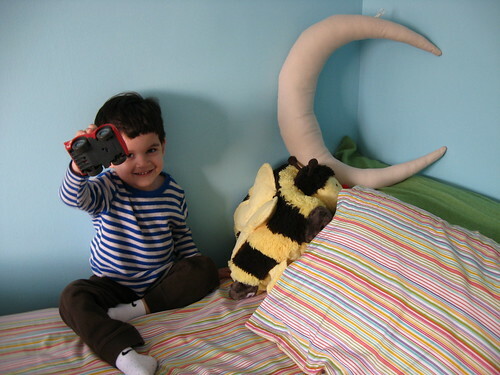 How adorable and ingenious! for your Etsy browsing pleasure, here’s a small collection of treasures I’ve found to celebrate this firefly season. Between unexpected bouts of late spring snow – including today – we have been venturing to gardens, parks, and flower festivals; passing housebound rain days by muddling through art projects and indoor tent construction; cooking a lot of comfort food; and visiting with friends. Good times. I have serious song love: following a tip from a blog friend, I looked up this song by The Civil Wars on YouTube and was instantly smiling and smitten by the vocals (“Barton Hollow,” live version – the official video is lovely, too). I am putting this song on our 2011 spring soundtrack for those clear, early morning and late afternoon drives to wherever – those times of day when sunlight just floods everything and driving with the windows down is perfect, regardless of the temperature (“Ghosting” by Freelance Whales, live at SXSW 2010). for something with a bit more groove, we’re really enjoying this collaboration between Japanese artists Tokyo No.1 Soul Set & Sara Mari (“接吻”). I first stumbled across Le Hiboo videos last summer and have been a huge fan since then – I love how they set up their recording sessions all over Paris and host such a broad variety of international artists. This song by gypsy punk band Gogol Bordello is crazy fun (“Pala Tute,” live). I’ve posted an unplugged version of this song before (“Rocket Ship” by Big Rock Candy Mountain) – it was on our 2010 summer soundtrack – and that’s still Bebe’s favorite: he gets superexcited to see his uncle. “Go Uncle — !” he says, dancing and smiling, “Go! Let’s dancing!” I really like this new video, it’s from one of their live gigs in New Orleans. Valarie from A Place Like This reminded me of my love for crepes this week, sharing her perfectly sized recipe – and who doesn’t love crepes stuffed with Nutella & strawberries for breakfast and/or tea? the ultimate veggie burger, recipe from 101 Cookbooks. BTW, have you seen her new cookbook? Absolutely chock full of yumminess. dreaming over the vintage-inspired line of children’s clothes over at Olive’s Friend Pop. We really can’t afford to buy boutique baby/toddler clothes, but the designs are delightful fodder for my sewing imagination. Tomodachi Calling (tomodachi = friend in Japanese) is a charity webshop pulled together by a group of international friends who were living in and/or visiting Tokyo when the earthquake and tsunami struck to the north. They’ve gathered designs by various artists that can be printed on a variety of Cafe Press items – t-shirts, mugs, bags, etc. – and 100% proceeds go to the Japanese Red Cross Society. I really like the Swedish Baustudio design, it reminds me of the giant, puffy chrysanthemum blooms that I saw during winters in Japan. According to estimates updated this week, at least 250,000 people are living in refugee shelters – as in, gymnasiums and the like. Japanese officials have also said that in the 3 most-impacted prefectures – Iwate, Miyagi, and Fukushima (a Japanese prefecture is the equivalent of a US state or Canadian territory) – at least 28,000 homes were destroyed by the earthquake and tsunami. I’ve volunteered in a lot of Red Cross and similar municipal shelters, and I also worked with many families who lived in FEMA trailer parks for several years after Hurricanes Katrina & Rita hit the US Gulf coast. So time and again I’ve seen the impact that, for anyone who’s suffered such a catastrophic loss, getting your own living space is a huge step toward emotional and practical recovery. I’m intrigued by this innovative housing project for getting folks out of shelters and into more permanent housing. It’s one of many other rebuilding initiatives that I’m watching. Reminder: If you’ve helped out with the Japanese relief effort, I still have 22 small Thank You tokens to give away. If you don’t want them for yourself, they’d all make cute little Easter presents. There’ll be a full moon at perigee tonight, big and bright and beautiful, so here are a few things in honor of the moon. 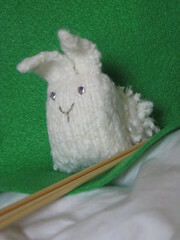 knitted bunny nuggets, free pattern by Rebecca Danger (available on Ravelry). My bunnies have different ears, so see my Rav notes if you’d like these tweaky mods. 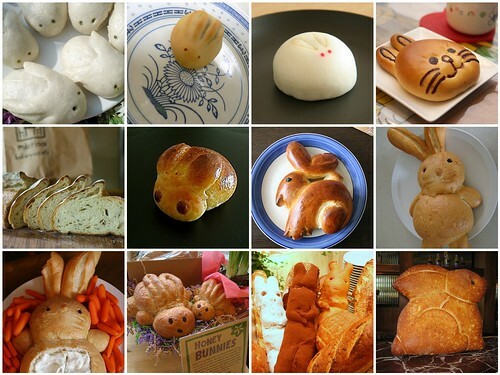 adorable bunny breads!! Great inspiration mosaic, ne? 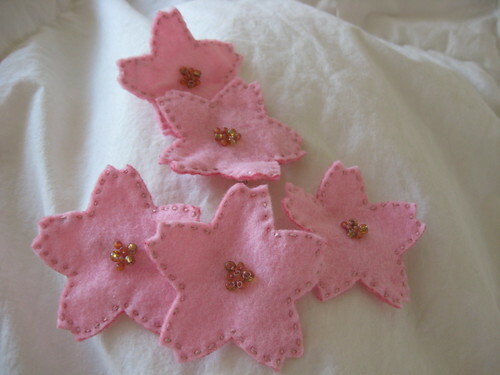 I’m going to try making these between now and Easter. 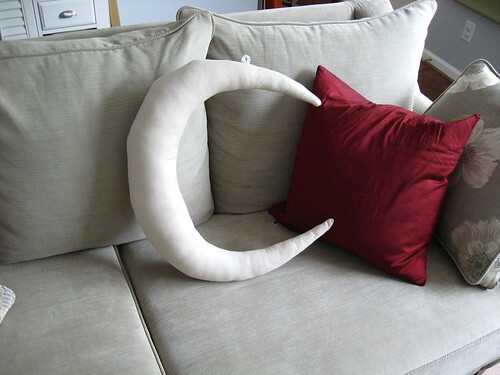 If you have any other great moon links, leave a note in the comments. 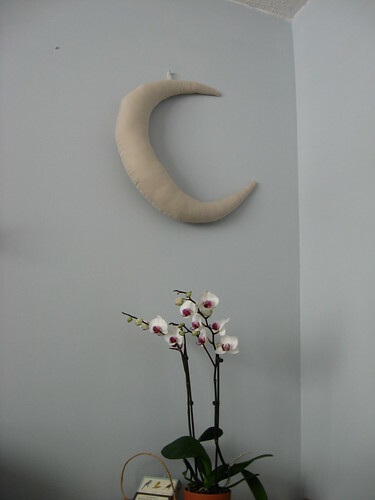 Hope you get to enjoy the moonrise tonight! 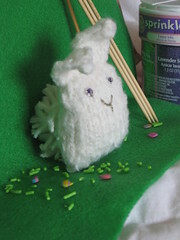 There has been plenty of knitting, sewing, craft love, Bebe antics, and frolicking going on at our place. But we’ll get to all of that another day – today is grey and windy and wet and cold, so I wanted to share some of the things that have been firing up my heart & imagination lately: lovely & wonderful inspiration. bread rolls shaped like hedgehogs!! can bread be any more adorable? BE LINEN MOVIE (15 minutes, 34 seconds) from Benoit MILLOT on Vimeo. Oh goodness, this song by The Cave Singers reminds me so much of my late teens and twenties, late nights and lazy afternoons playing guitar and singing with friends (“Haller Lake,” unplugged). Good times, great memories. this cheery little song by Kokia (“Dandelion,” unplugged). Again, catching up on posts! Last week was focused on creativity: following the little sparks of inspiration and feeding them with time and attention. gifts of brownies and supper pie and soup; our public library; music by Love Psychedelico, Beth Orton, and Nick Drake. sleepless nights and sleepy days; rain, drizzly rain. 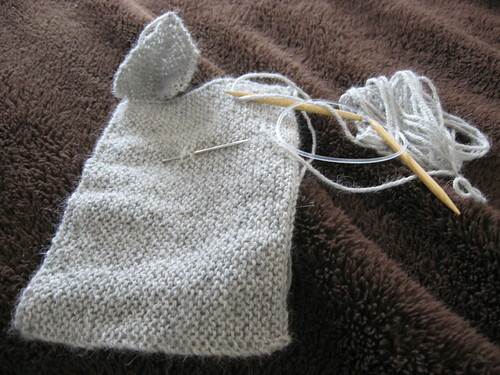 and working on a few original knitting patterns – toddler sweaters and an Easter toy. A random gathering of feathered loveliness today, in reply to a day that is overcast, with biting bursts of wind, and the kind of cold that makes my bones ache. Also in response to a toddler who Will Not Nap, preferring to read books, run around and around and back, and dance. We’re dancing a lot today. And staring into the wind, heads tucked low for warmth, watching the day with bright eyes. 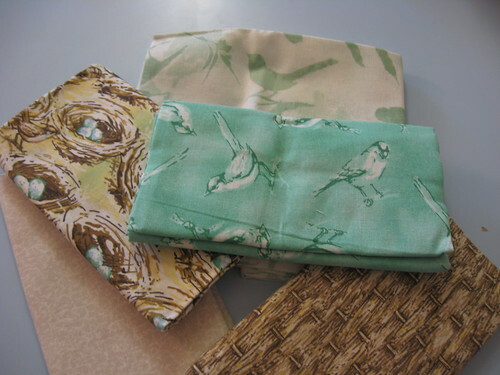 Here’s a sweet bundle of birds, twigs, and nests, newly nestled in my fabric stash. They called out to me as we headed toward the checkout line. They sang pretty songs and asked, was there room in my nest? Of course, I said, of course you can come home with me. I really love the red cardinals in this Choose Joy print from eva juliet on etsy. Finally, here is the kernal at the heart of our day, a snippet from one of my favorite poets. all the birds of the winter whistle. I hope you are warm in your nest today.